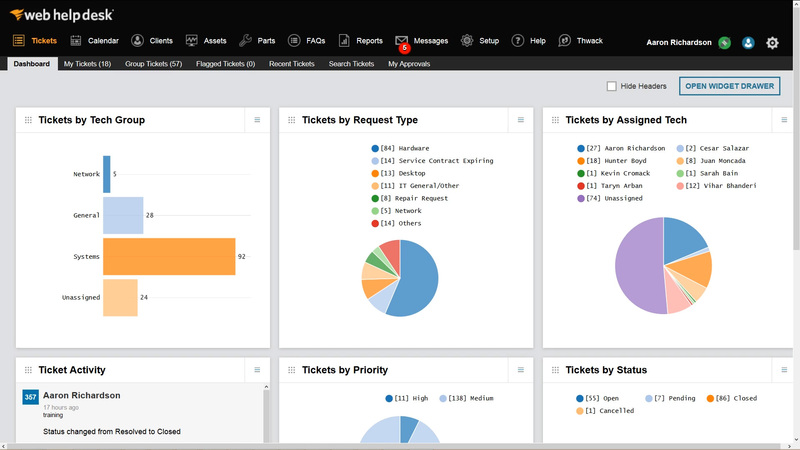 The integration of Web Help Desk™ and Dameware® Remote Support enables you to simplify ITSM from ticket request to resolution. Remove the need to manually manage support tickets and start using remote access to address problematic end-user machines and IT systems for faster troubleshooting. 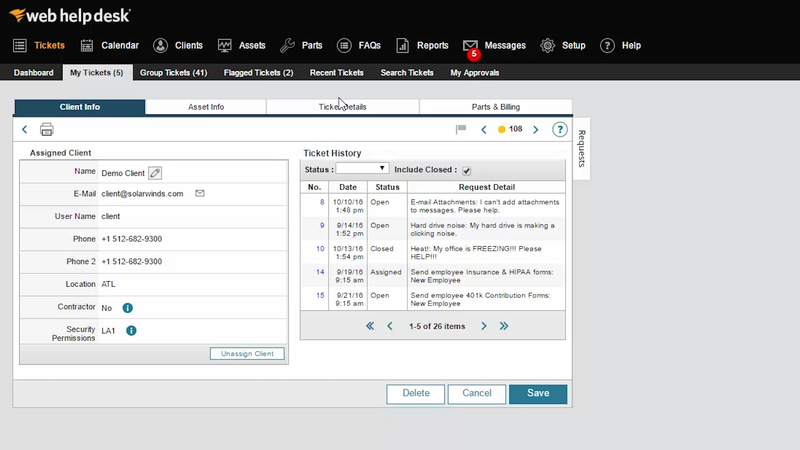 Respond to tickets quickly with remote support capabilities, and track and measure technician performance to continuously improve customer satisfaction. This chart provides a sample of the key features enabled by this combined solution. Sometimes getting to the root of an IT issue involves going right to the source. Included within the solution is Dameware Mini Remote Control, which offers multi-platform remote access to Windows, Linux, and Mac OS X computers, laptops, and servers from a single admin console. IT issues know no bounds, so why should the ability to troubleshoot IT issues only be reserved for machines on the network? Initiate secure over-the-Internet remote connection with computers inside the LAN and over the internet. IT admins have enough on their plates without having to make house calls for IT troubleshooting. Use remote access to reboot systems, start/stop services and processes, copy/delete files, view and clear event logs, and more. As if IT issues weren’t bad enough, a total halt to productivity to resolve them might not be necessary with the right tools. Offers system tools and TCP utilities to remotely troubleshoot computers without having to launch a full remote control session. IT admins are constantly on the go. Give them the tools they need to do their job effectively, no matter where they are. Use the Dameware mobile app to remotely access network computers from mobile devices. Wouldn’t it be nice to be able to control who has access and who does not, and help the CEO gain access when he forgets his password? Manage multiple AD domains, groups, and users. Remotely unlock user accounts, reset passwords, and edit Group Policy. Knowing how a group of computers is configured, and what software is actually being employed, could help you get to the bottom of some of your most troubling questions. Easily export AD properties, system configurations, and software information in .CSV or .XML formats. Going through disparate systems to manage accounts can be a major burden. Centrally manage your Dameware environment, user accounts and permissions, and simplify Dameware license management globally. Whether your security protocols or compliance initiatives require it, keeping your remote support system secure is a must. There is simply too much to lose. Enforce two-factor authentication in security sensitive environments using Smart Card logon and authentication. Don’t let non-responsive machines keep you from resolving IT issues. Remotely connect to out-of-band computers with Intel® vPro™ with AMT, Wake on LAN, and KVM support. Automate service request management through ticket creation, assignment, routing, and escalation. Leverage a built-in help desk knowledge base to create and maintain KB articles and promote end-user self-service for common issues. Set up “SLA breach approaching” notifications and date-specific SLA reminder alerts. 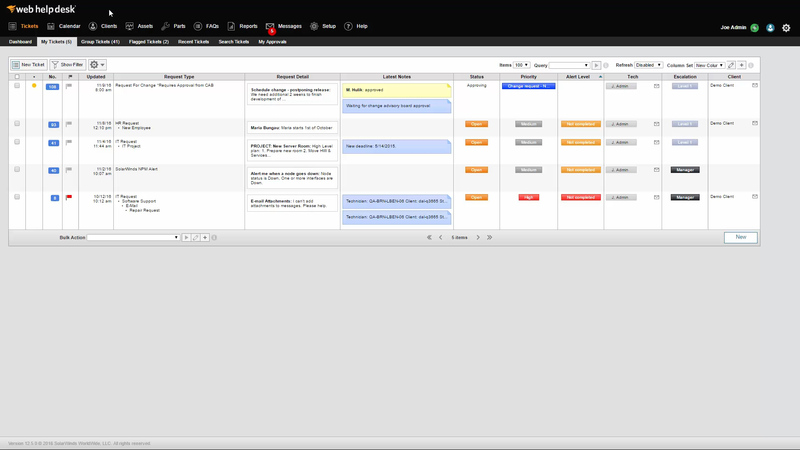 Customize escalation and de-escalation workflows. Issues involving multiple tickets should be managed in lockstep to avoid chaos. Link service requests to each other to track and manage IT projects involving multiple tasks, regardless of type. Your service management software holds a wealth of information. Don’t let it get into the wrong hands. 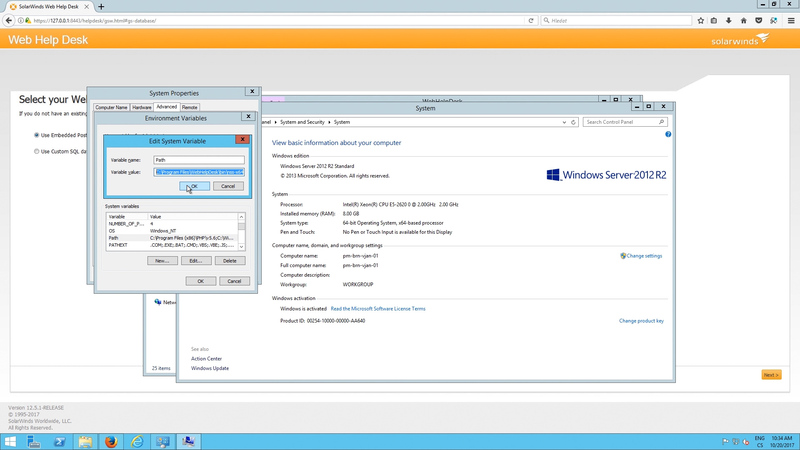 Automatically discover and add client information to Web Help Desk from AD and LDAP servers. Good end-user support means staying on top of customer satisfaction and how your team performs. Configure automated feedback surveys for end-users upon completion of service request. The hardware, software, and other IT assets supporting your business are ever expanding. How will you keep up? Employ out-of-the-box integration with JAMF Casper Suite, Absolute Manage, Microsoft SCCM, and SMS. Manually generating tickets takes time away from the real problem at hand - resolving end-user issues. Use IMAP, POP, and Exchange protocols to automatically convert service request emails to help desk tickets. Depending on the industry you serve, the data and systems service organizations you interact with can vary in terms of their sensitivity. Improve security via FIPS 140-2 compatible cryptography support, and FIPS-mode SSL connections. Managing the use, availability, and health of IT assets, and tracking this over time, is a major undertaking, especially as your business’ IT footprint grows. Simplify IT asset management with built-in asset discovery, inventory management, and reporting. Checks and balances makes service management feasible. Regulate and manage change requests through automated approval workflows and panel voting options. Tracking the progress and performance of your support team is critical for meeting end-user expectations and other requirements. 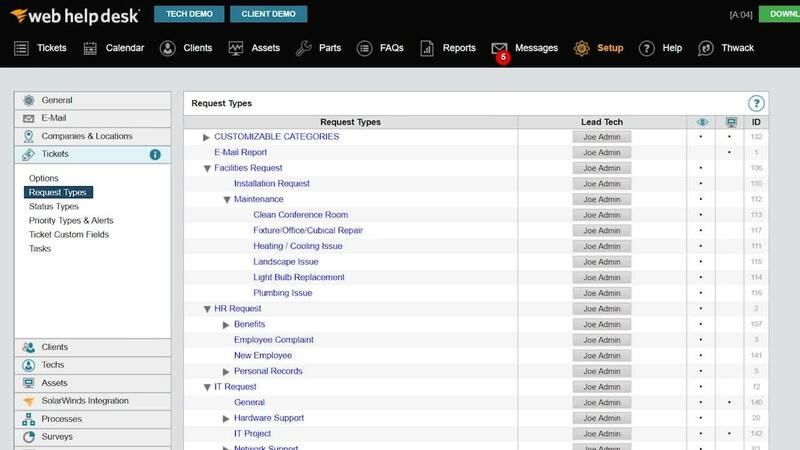 Use built-in reports and dashboards to track ticket status, technician performance, and customer support needs. Why add Dameware Remote Support to Web Help Desk? Why add Web Help Desk to Dameware Remote Support? Is maintenance included with purchase? Combined, the two enhance help desk and tech admin efficiency. In just one click, launch a Dameware Remote Support session from Web Help Desk IT tickets or the IT asset inventory. The two work together to help you quickly identify and resolve issues. Create a new Web Help Desk ticket directly from the Dameware remote session. You can also save remote session metadata, including duration, chat history, and screenshots back to the IT ticket to further assist in troubleshooting and escalations. Maintenance is free for one year. SolarWinds licensed products include a year of free maintenance, starting from the date of purchase. Annual maintenance can be purchased at a fraction of the list price. Discover the benefits. Absolutely! We’re here to help. Our Success Center offers a variety of resources to help you get started using Help Desk Essentials. You get in-depth documentation, help with installation and configuration, a library of training videos, and regularly scheduled training classes. We have everything you need to get started and ramp up quickly. In-house tech support is only a call or click away. We offer excellent, in-house technical support from professionals whose goal is to help you solve your issue in one phone call. Beyond this, THWACK®, our very own user community of IT professionals, serves as an excellent resource to consult and learn from other Web Help Desk and Dameware Remote Support users. IT service management (ITSM) refers to the activities involved in delivering IT services to customers. This may involve the use of help desk software for ticketing and IT asset management, receiving and routing support tickets, and troubleshooting and resolving issues.